Worrying is like a Rocking Chair… lots of action, but going nowhere. I don’t think that was ever my mom’s intention, to make me feel worse. But I didn’t really have the power to shut it off, just because she slapped a label on it and implied I should knock it off. I just didn’t have the tools. In parenting, we do that sometimes, consciously or not. We either step in to solve the problem, or we dismiss our kids’ concerns as not important. Solving the problem for them prevents them from figuring it out, and then ultimately trusting themselves that they CAN figure out problems. It keeps them dependent on others for solutions – always waiting to be rescued by someone smarter, stronger, more resourceful. See the problem with this route? And if we gloss over their worries, they’ll learn to take them somewhere else. They certainly will learn that they can’t share them with you! And you’re supposed to be the one helping them figure out the tough lessons in Life. If you take this option, you miss a huge opportunity to not only help your child, but also to reinforce your relationship with them. Your mind can only think about one thing at a time. Attaching yourself to a particular outcome is where the suffering starts. We don’t know everything and we really can’t see around the proverbial corner. How many times can you look back and see that something really seemingly catastrophic turned out to either make you stronger for something else or yourself, allowed you to relate to someone in a different way, or opened you up to some unforeseen opportunity. So thinking, “I don’t get it – right now. But maybe I will down the road,” might be a helpful approach. Is the bad thing happening now? Ok, then. Breathe. This is all about living in The Present moment. I’m not saying to live in La-di-da Land, look at what’s happening now. Is it where you want to be TODAY? Is it what needs to be happening NOW? If you can look at the situation more calmly, you’ll be able to assess the situation more accurately than if you’re full of anxiety. You’ll have time to panic when/if it does show up. Visualizing GOOD things happening can be just as powerful as visualizing the worst case scenario – so do that! Getting in the habit of doing visualizations can start at any age. When you’re putting your child to sleep, help them to visualize some peaceful happy setting. Remind them that they can go back there in their mind at any time. We spend so much time panicking about that imaginary horrible scenario – what would happen if we spent that much time visualizing great stuff? So how about taking it even to another level? What if your visualization was about conquering that fear you’re worrying about? What if you think about succeeding in that situation that is distracting you from the Present? Run a few of those scenarios in your head and see how that feels. Which story you decide to tell yourself is TOTALLY up to you! Neither are based in facts, so why not be kinder to yourself? Physically, this will help you as well. A body that is constantly anxious and tense will act a completely different way from one that is content or even happy. So choosing a happier story is kinder to your physical body as well as your mind. Have a handy list of your strengths or of things you have accomplished. This may seem odd at first, because we’re taught that focusing on our good points is conceited, egotistical – definitely not a good thing. But when you think about it, how could being ACCURATE about yourself be a bad thing? Sure, you may not want to regale everyone at Park Day with all your wonderful accomplishments, but tell yourself the truth. Make a list of the things you feel good about accomplishing, things you are genuinely thankful for… this list will boost your self-esteem and help you when you’re at a low point. It’s as if you are looking through two different lens: one of Scarcity and one of Abundance. And it all boils down to your personal perception. If you feel full of whatever you’re wanting, you are much more at peace than if you are worried there simply isn’t enough to go around. When we’re afraid we’re not getting our fair share, we resent those who we think are getting more than us. It’s not a pretty picture – but it is incredibly common. Unfortunately, this has a huge impact on our day-to-day attitude, on so many levels. It keeps us unhappy and negative. But using the other lens, think of yourself as having so much that you can share and be generous with others. Society often throws us into unnecessary competition. But think about when you helped someone else – with no gain for yourself. You felt happy and positive about the world. Why not try to do that more often? Help someone else. It doesn’t do anything to diminish your own light. Take a break from your own melodrama for a while and find someone less fortunate than you. Help them…and you will end up helping yourself. That’s probably a pretty good start at my list. Incorporating these kinds of ideas into your child’s world – or even more firmly in your own world – will really help us all reinvent that dang What If? Game. Unschoolers spend lots of time together – and for the most part, it’s an exciting fun adventure! Yet sometimes, even the best unschooling mom can get tired or distracted. When I was little, I was one of those children who talked a lot and LOUDLY. I can remember my cousin actually turning to my dad saying, “Does she have a volume button?” Obviously, I did not. Nor did I forget the comment. I tell you this because I want you to know that I get it. My mom, who had an exhausting job, would have to come home to this high energy kid who wanted to talk and talk and talk. I can remember sitting on the floor while she read the paper or a book and just nodded along at me. I’d ask her, “Are you listening?” “Mhm,” would be her reply. Nothing more. I knew she was not listening. When my kids were little, I was trying to juggle a variety of things at once. My kids were around all the time, obviously. They were ESPECIALLY around if I was on the phone with someone. Which was often. The internet was just taking off and I was thrilled about talking with other moms from around the country. My kids would ask me questions and bring something to show me. They’d ask me, “Are you listening?” “Mhm,” would be my reply. Nothing more. I wasn’t listening to them. Skip forward another decade and shoe is on the other foot. My teens are sitting with me in the car. I’m asking them something about their day. They’re texting on their phone. From the moment they walked out the door, then there was a brief moment of “calling shotgun” for the front seat, then back to non-stop texting. I’d ask, “Are you listening to me?” “Mhm,” would be their reply. Nothing more. They weren’t listening. I give all three of these scenarios because I think you’ll be able to relate to at least one of them. No one was doing anything malicious in any of these situations. People were just caught up in the moment. Everyone has probably been the victim and the ignorer at some point in their lives. Probably at multiple points in their lives. But I think as parents who want to do better – as PEOPLE who want to do better – we need to adjust ourselves. Life flies by quickly. Now that I’m in my 50s, I’m well aware of that fact. The people who are in our lives are there because we value them. They deserve our attention. Real attention. That attention we give indicates to them how much we love them, how we appreciate them, how they MATTER in our lives. It’s a habit of laziness really, a lack of thoughtfulness. It’s not being fully conscious about the every day life decisions we are making. I really want to be present for the people that are in my everyday life. And I want them to be present with me. If your child wants to talk with you, appreciate them. Give them your full attention. They are mentally noting how you interact with them. It’s telling them their worth and your interest in them. And think of how that translates for later in their life…if a mother is not interested in them, who would be? These are big messages we are conveying and so often, we don’t even realize it’s happening. Make an agreement that there will be actual conversation with the person in front of you – your child, your partner, your friend. Put down the texting, stop reading your email, don’t glance at your Facebook newsfeed. 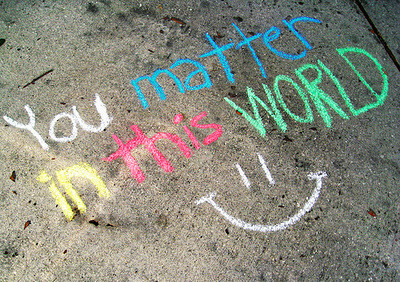 Let people know that they DO matter to you. Look them in the eyes and really listen to them.